We missed some apples on the apple trees. They’re frozen now. I was rather surprised that we missed so many apples on this one branch. They must have really blended in with the green leaves of the apple tree (which are now all brown and on the ground). 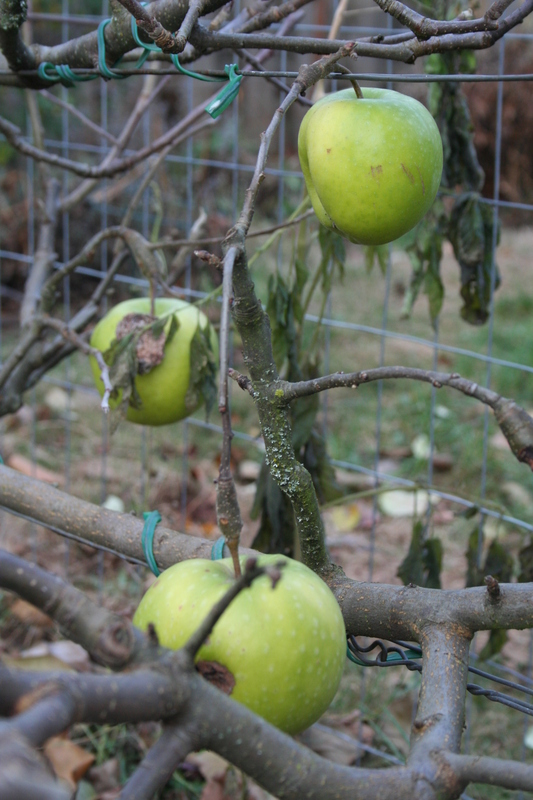 While I was snapping these photos of the forgotten apples, I realized that without the leafy green of the trees and all the other plants in the garden, you can actually make out the form of the espalier. 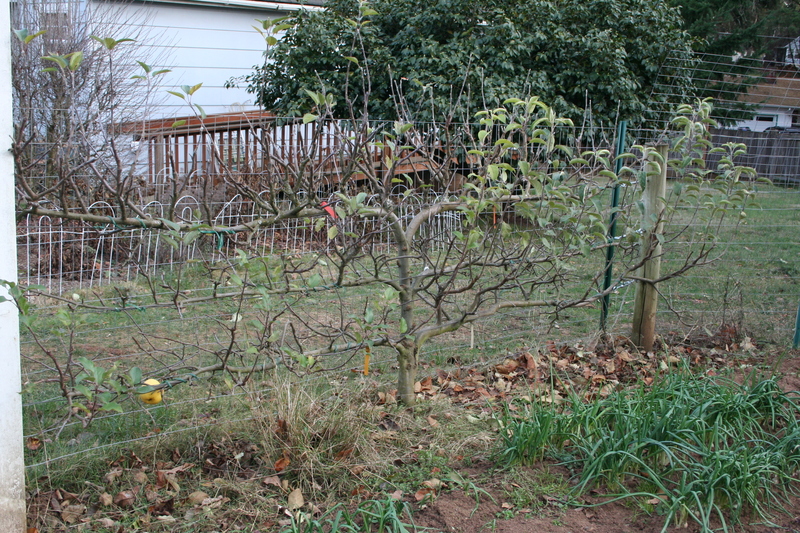 We only have the two, but we hope to have many espalier fruit trees around the yard as time goes by. They save on room, for one thing. They form a nice fence around the garden. Espalier is a horticultural form that my husband is very interested in. These two are his second and third such trees (we left his first behind when we moved from our former home to this one). I am not so much into it (looks like way too much work), but I enjoy the fruits of Don’s labors (pun intended). Once, I attended a class on espalier with Don. The speaker did not like espalier where several varieties of apples are grafted onto one root stock and even discouraged it. But all of ours have been just that sort of graft. We have a total of six varieties of apples on these two trees. 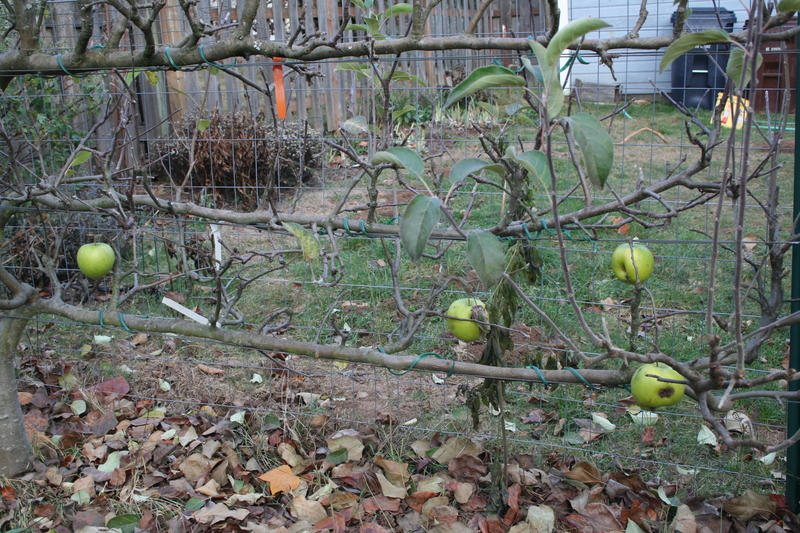 I am not going to attempt to explain espalier or get into some deep gardening discussion on it. I haven’t the first-hand knowledge, for one thing. They are Don’s trees and he tends them. I know enough that I could prune them and keep the wires taut. 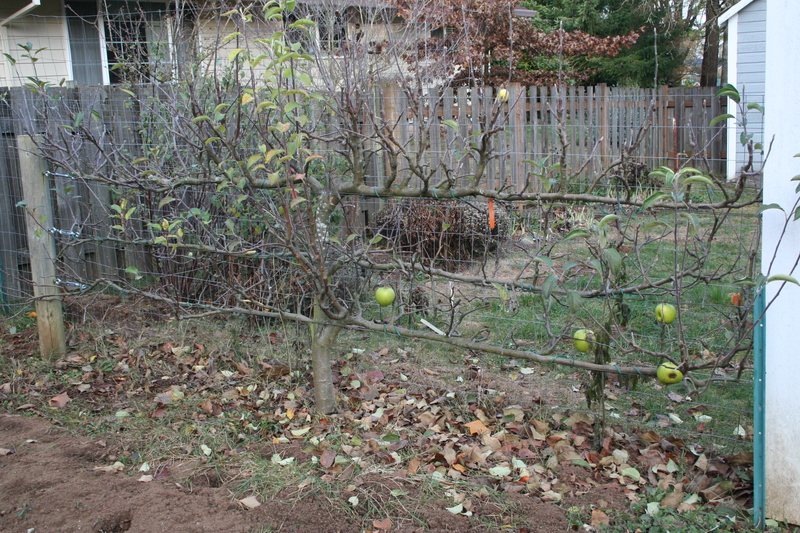 There are several designs of espalier and a lot of resources, both on the Internet and in gardening books. It’s just another one of those things that I should pursue more in-depth but I haven’t taken the time to do (yet). They do look pretty, however. I can understand why Don is interested in this type of gardening…I would be doing this too, if I could. It’s beautiful, and must be rewarding to have some success with.